Ontdek de meest iconische fauna van IJsland met een 2,5 uur durende walvis- en papegaaiduiker-tour vanuit Húsavík op een RIB-speedboot. Geniet van het uitzicht op de Skjálfandi-baai terwijl u langs de kust slingert en een uitgestrekt gebied bedekt in het krachtige vaartuig. Kijk uit voor enorme blauwe vinvissen en acrobatische bultruggen en leer over het leven onder het oppervlak van je ervaren gids. Tijdens het broedseizoen van half april tot half augustus, bezoekt u 'Puffin Island' om een bloeiende kolonie felgekleurde vogels te vinden voordat u terugkeert naar Húsavík. 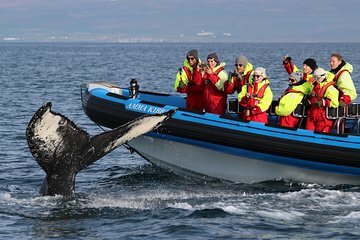 The desk hostess, Ms. Sandra Mosquera Montes, initially scared us by saying that the first boat that went out at 9:00 a.m. a slow boat did not see any whales, and did we still want to go? 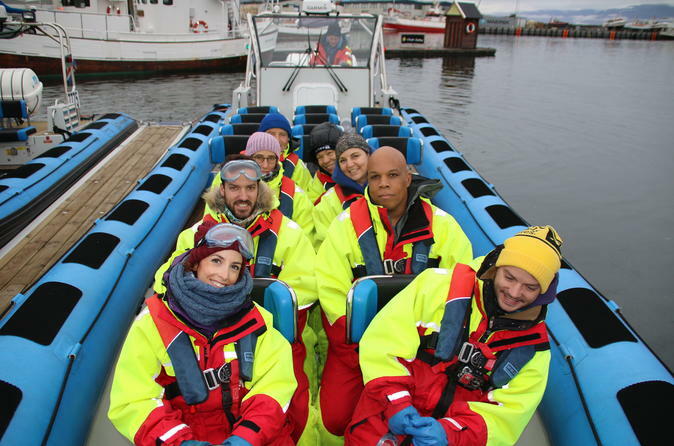 I was originally leaning towards the cheaper, slower boat, but then I had a conversation with the receptionist at the Fosshotel Husavik, and she said the speed boat is better since it can go quickly to where any whale may be. That analysis made sense!! The speed boat lived up to its billing!! At the helm was Head Captain Sverrir Yngvi Karlsson, assisted by our guide, Head Guide Sarah Arndt! Captain Karlsson headed straight out into the bay, and with Ms. Arndt's assistance, we were on majestic hump back whales within a half an hour!! We tracked two, then two more, then single whales and finally a grouping of four whales together!! We were SO close to the whales!! Ms. Arndt was very informative during the course of the tour. Captain Karlsson kept us on the whales the entire time!! All together, we saw six or seven hump back whales! Each of their tail undersides have unique markings. It was well worth the extra money for the speed boat!! There were no Puffins since it was past their season, but it was still cool to see what we did see!! Photos below show some of the excitement!! Look at how close those fins are to the side of the speed boat!! At the end, Ms. Montes said that she was just being honest since there was a chance we would not see anything. So glad that we did see whales!! Ms. Montes and Ms. Arndt was also very helpful in arranging for me to borrow a card reader when I ran into a problem with my EOS 7D, Mark II camera!! Everyone was so nice, and I highly recommend Whale Watching with GENTLE GIANTS!!! Tour itself was great! The tour guide was awesome and fun! We got to the whales faster and closer than anyone else! The only thing that I did not like was the rude lady at the Gentle Giants front desk. She moved our reservation and was very rude the whole time. This tour was one of our favorites while in Iceland. It was incredible! The boat driver made it tons of fun, and there is nothing like seeing whales so close. We're soooooo glad we decided to go with the more expensive RIB boat, it was a much more up close and personal experience! This tour exceeded our expectations. Marine biologist guide and driver were both top notch. Puffins, dolphins and whales galore! One of our highlights on our 3 week cruise! A great time, even in the rain! Very friendly and knowledgeable staff. the whale watching was good not great.